It’s a jungle out there! Razor Group leads your company through the brush and out of the jungle of confusion using an Inbound Marketing system that will grow your business. 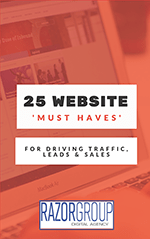 Learn about these must have elements every website must have divided into 4 critical areas of focus. Razor Group is an agency that focuses on generating new business leads for our clients through inbound marketing techniques and methodology. Every great inbound marketing campaign begins with great branding and design. Razor Group offers branding design and website design and development services . We will build a website for your company from beginning to end including custom responsive layouts that are cutting edge and perform perfectly across all devices and screen resolutions. Our team will also design custom logos and graphics to assure your company’s branding and style are clearly displayed through out your online presence. Other content creation includes video production, photography, copy writing and e-commerce solutions. We can then apply your new image to your printed marketing efforts as well as with design and layout services that will seamlessly connect your online image with your off line image, including business cards, brochures, signs and more. Razor Group is a HubSpot Agency Partner specializing in inbound marketing. We use the Inbound Marketing methodology, embraced and perfected by HubSpot, to provide and consult your company on how to use the HubSpot marketing automation software platform to turn your website, blog and social media pages into lead generating machines! We also offer Google AdWords consulting and management and SEO (Search Engine Optimization) services to get you ranked on the first page of the major search engines. Social media management and strategy plans to make your company part of the conversation in your industry and create demand is also what we do. Allow us to put together and execute a comprehensive inbound marketing plan for you with a combination of these services that will attract, convert, close and delight the customers you are looking for. A solid online presence with a comprehensive internet marketing plan is powerful and in today’s world it is absolutely mandatory in almost every industry and type of business. Whether you are just getting started or have been online for many years, it can be overwhelming to deal with all of the options, complexities and continual changes in technology. The search engine algorithms, social media platforms and the latest online marketing techniques that you will be faced with are being developed and updated constantly. Allow Razor Group to relieve you from the stress involved in learning and keeping up with it all by working with you to put together a plan and assist and teach you and your staff about what you need to know and what you need to be doing online to compete in today’s market place. As a CEO, Small Business Owner or Marketing Manager of a business you have many responsibilities and you need help. We are the help you need to make your online marketing efforts a success!